It's Not Work, It's Gardening! : Mistake, Opportunity, or Learning Experience? Mistake, Opportunity, or Learning Experience? 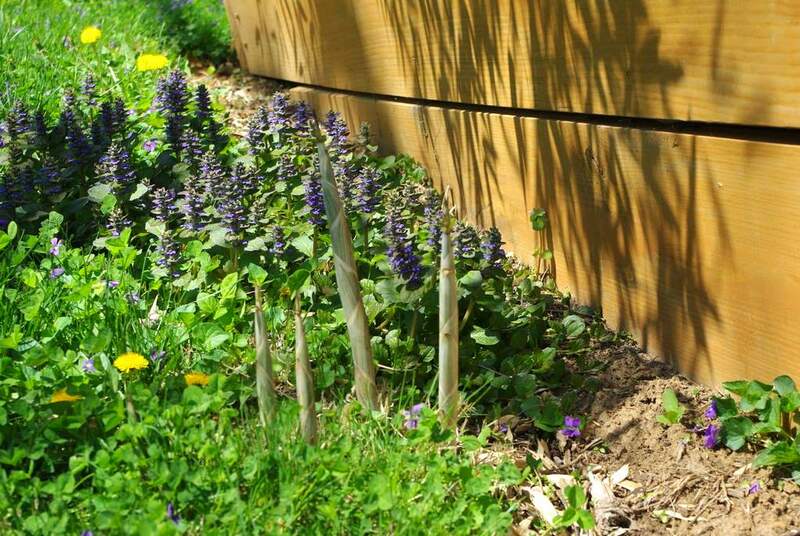 (That's a photo from last Spring) I built that box a couple of years ago, and slanted the walls outward in an effort to help deflect any rhizomes upward -- the idea is to convince them not to go deep into the soil, because that makes it harder for you to detect and keep in check. Because this box is on a hill, and to keep it visually appealing, I made the top of the box level, so the one side of the box is only 12" or so tall, while the other end is about 3 feet deep. 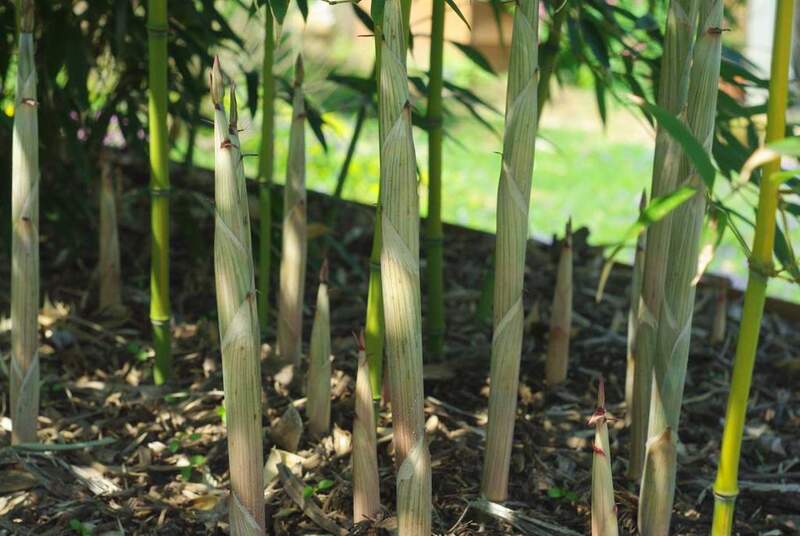 The bamboo planted here is Phyllostachys aureosulcata or "Yellow Groove", a very common bamboo in this area and other parts of the country because it can attain a pretty decent size (1-2" diameter culms, 30' tall) and is very cold-hardy. It loves living in this box. There is a mulch-filled trench around the whole box, which I use to check for escaping rhizomes a couple of times a year. I found a couple escaping at the low end of the box, which were easily cut and removed. I was also checking the trench at the deep end of the box, but not as carefully. Everything I've read said that Phyllostachys rhizomes won't go more than 12 - 24" deep. 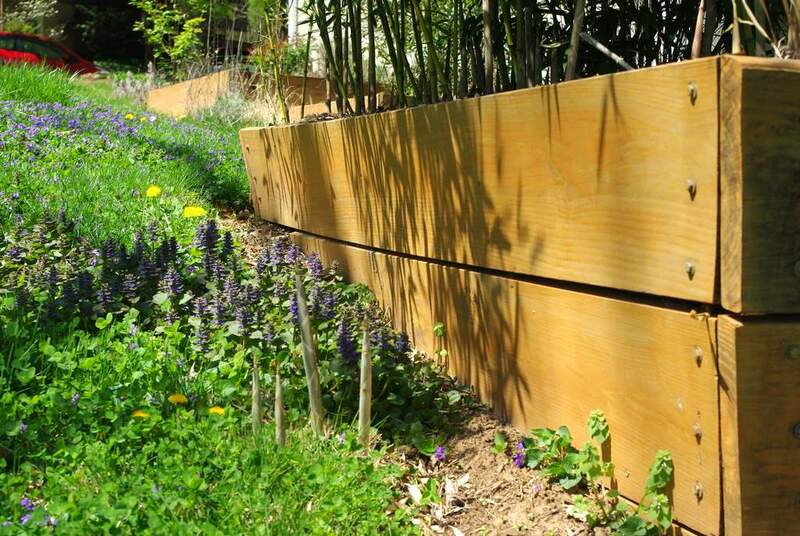 That's why they sell bamboo barrier material (which is a thick plastic sheet) that is 24" or 30" in height. It looks to me that I have possibly two rhizomes that escaped the South side of the deep end of the box last year. There was one shoot a couple of feet further out than this little group, so I know the rhizomes have made it further out than this. So that's the plan now. I'll need to keep the rhizome spread in check, but then later this summer the plant will be ready to dig. So I think this was all three: a mistake (not checking more carefully for excaped rhizomes), an opportunity (new, easy-to-dig plant in a few months), and a learning experience (the rhizomes can go deeper than I expected). They are all part of gardening, right? 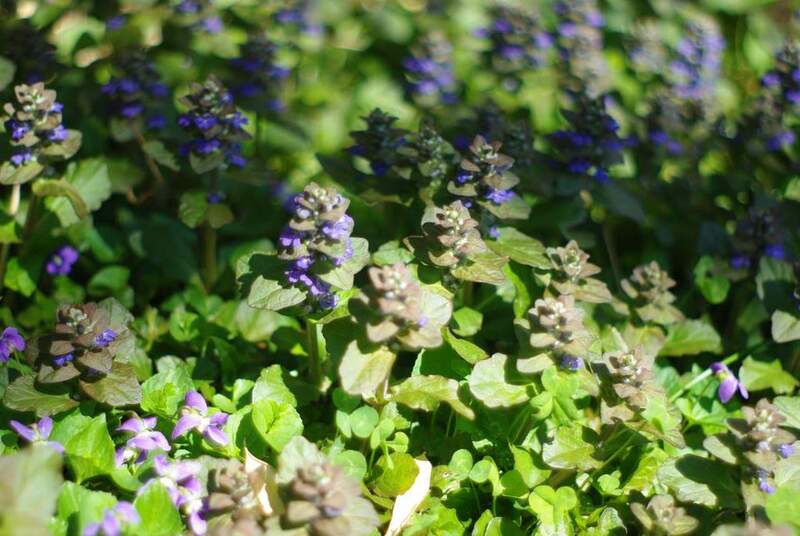 By the way, that nice dark groundcover plant with the purple-blue flowers is ajuga reptens, or "bugleweed". 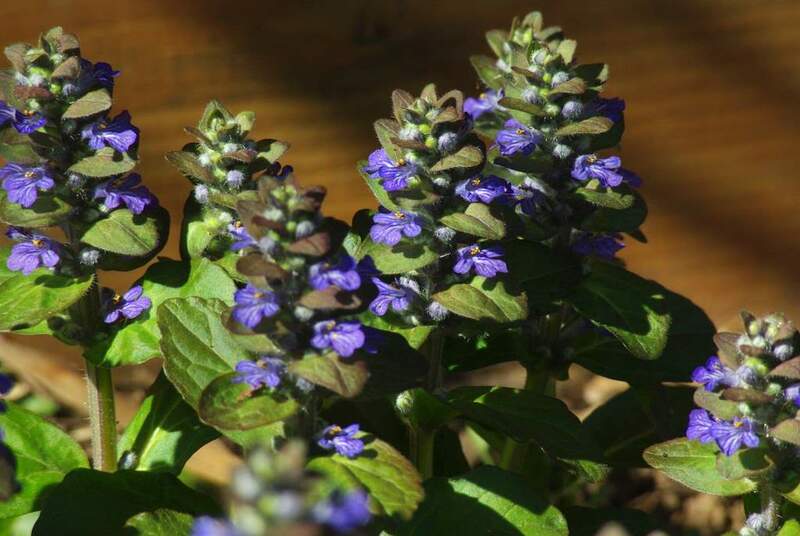 It's a nice, vigorous plant that spreads pretty fast. 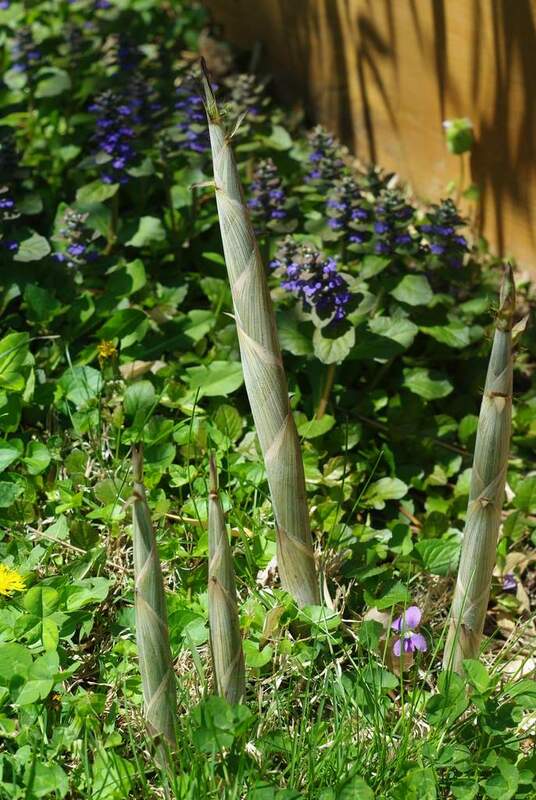 Because of this vigor, it's considered a weed in many places -- although most people don't let it grow in their lawns like I do, but I really like it. 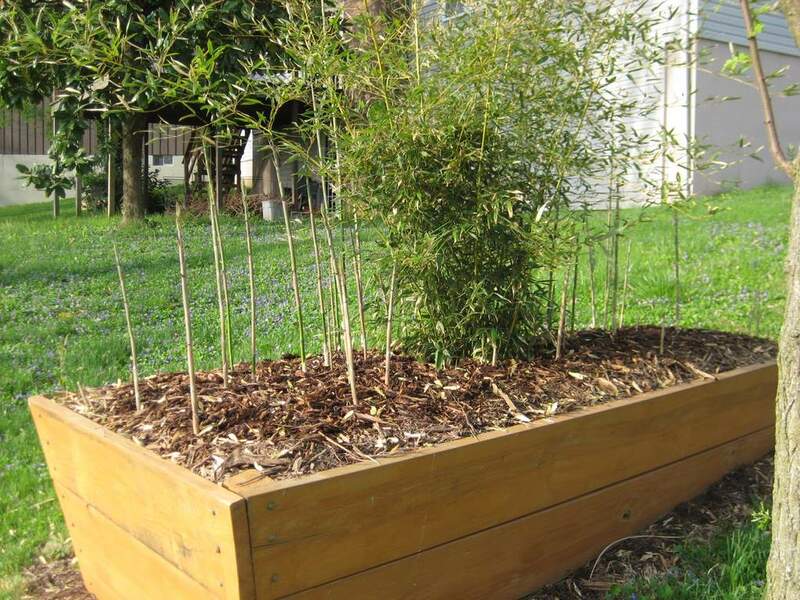 As fast as it may spread, and as vigorous as it may be, it's no match for the bamboo though.